We are very slowly redoing our mobile home kitchen! It’s a pretty exciting process to see, as I scour the internet for a balance of eco-friendly and our limited budget! ~ paperbag flooring until the wall at the left of the rolling dishwasher, then painting or tiling the rest (grease does not do well with paperbag flooring! ), including paperbag flooring the livingroom (and the rest of the home). Here are some before photos! This is a work in progress. Check back later for updates if you would like! My tongue tie has been tight as long as I could remember. I knew my frenulum was restricted even before I knew it as a frenulum or what “tongue ties” were or that it effected anything. Awhile back, I had a friend share pictures with me of an OLD book she owns, in which tongue tie revision is noted in its own section. Revisions are not some new little fad. Take a look at page 326-327 of Dr. Chase’s Recipes, from the year 1874!! (What this means is: breastfeeding has always revealed this. Synthetic formula has masked it and led to lifelong issues for so many people!) I’ve read other articles that say revisions were taking place in the late 1600’s, too, but there was no citation for it. Recently, that same friend had her tongue tie released and has expressed much of what the woman in that video did, and more. Migraines gone, pigeon-toe gone, her face shape has changed! She was the catalyst for me wanting to get a release, too. Here is a pretty lengthy list of the things an adult can suffer because of a tongue tie – it’s pretty intense! There are many stories of tongue tie releases as adults – very much worth reading! “I Wish I Wasn’t Tied” is a blog dedicated to collecting these stories. The comments from this were wonderful, with one of the women saying she wanted to learn to DIY tongue tie revision. I thought I might be one of very few who weren’t just “tempted,” but were actually serious and determined. Her comment spurred me on to finally start researching how I could *safely* revise my tongue tie, if I decide to DIY it after researching. So, this post is about what I have learned and, eventually I will add the before and after. This is NOT medical advise. This is not an encouragement for you or anyone to go and do this, either. It is informational only. Craniosacral therapy before and after revision is really important – this releases built up tension that has been created all over the body from the oral restrictions. Having a natural provider help you is vital, as is CST self-treatment between sessions. Kava kava is a good numbing tea that would be useful for adults (who are not pregnant or nursing), but I’d be likely utilizing an essential oil blend for pain, if anything. Babies tongue ties are not as fully developed in the fiberous aspect yet, and adults have more fibrous tissue in there. It’s the only reason I contemplate using a numbing agent. Rethinking Tongue Ties: Anterior Vs Posterior Is Irrelevant is where I first understood that in order for the revision to be successful, you must cut back to create a diamond shape. I do really well with seeing things in action to know what to do. Here is a video that shows a nearly good diamond-revision, with laser. It looks like it needs to be further revised horizontally. This video shows an excellent diamond-revision, plus fibrous tissues are quite clear. I appreciate that the revisionist went back a second time and ensured a clear diamond cut. Within the family birth and home birth communities, it is heard of that a mom, dad, or midwife simply takes longer finger nails and snips the tongue tie. But, again, an adult tie is more fibrous, so I looked around for frenectomy tools. I found a 2-set of tenotomy scissors and a tongue director for under $15 total, on Amazon. Pain relief comes in a few different forms. With my babies, after they have been revised by drs, I give them Rescue Remedy for Kids for the trauma, Arnica Montana for speedy healing, and apply helichrysum essential oil (it will be copaiba essential oil from now on, now that I have that) externally around the outside of their mouths for pain relief. I decided on these three things based on several sources (among others, these just make the information concise as to why I avoided certain things and chose others). For now, this is my little collection that I have found pertinent to possibly clipping my own tongue tie. I am still researching and looking for information to feel certain I understand both the procedure and the potential pros and cons of attempting this in my own home, on myself. I’ve had a makeover in mind for my bedroom for awhile now. On a limited budget and knowledge of volatile organic compounds being hazardous to health, I searched a very long time for an affordable DIY natural paint, for various places in my home. And I took a long time to slowly buy individual supplies once I knew what to do with my bedroom. Calcium carbonate and charcoal mix as the colorant – exactly the shade I was hoping for! I finally found what I hoped would be our bedroom wall paint, flour paint. But, something went very wrong with this mix, despite that during later pregnancy, I stood over a stove for 45 minutes and followed the directions. I had the soothing grey that I wanted from the mix, until I added the iron sulfate. Then, at the top, was a horrid baby-poo-like green. I would mix and it would look okay for all of a moment, when the film formed on top would be the green. When I let it set to cool down, the entire top became that green. Underneath was the grey I wanted, but atop… where it dried, putrid green. Despite this, when the paint cooled down, I wanted to see it’s coating ability. I did a nice thick and even coating and it was quite transparent – it would probably take about 10 coats to cover the pre-existing paint… nothing like the image of the barn in the link above. Those hunks of green only worsened as it cooled. In an interesting twist, we are in the midst of repairing our roof. A co-worker of Daryl’s is really good at construction and offers good pricing (he owns his own business). He heard I was looking for no-VOC paint and offered to let us buy no-VOC paint through his business at his cost, for a name brand. It’s actually cheaper than making the flour paint, through him (far more if we purchased on our own). It’s not my ideal, but it’s better than toxins leaching into our home/us. I’ve already painted one closet door in a no-VOC paint, as a tester. One flop allowed me to find a cheaper alternative that I don’t have to make myself, which at this stage in pregnancy, is a real helper. Now, to get the room painted before this little one comes earthbound! Before Daryl and I even knew each other, he purchased a home and painted the walls in every room. When we were first married, his mom often commented to me how now I could “paint all the walls nice colors,” but aside from one color, I really didn’t care… I was grateful we had a home to live in! Aside from the gratefulness of not being a vagabond any longer, I really did like the idea of the terracotta living room being paired with a sharp black contrasting element. Neither he nor I knew about Dressing Your Truth at the time, but now I am quite fascinated with his color choices and my desire to use black with it! You can see most of it in this post. I’ll add more “before” pictures when I update, too. All of the rooms but one are very “earthy.” Two rooms are some awful, dreary shade of red, and while I have not been fond of them, it was on the bottom of my “have to do” list. I’ve often thought, “I want to make these rooms peaceful and calm without feeling like a cave.” I just didn’t have a new color scheme in mind, so didn’t bother about it. 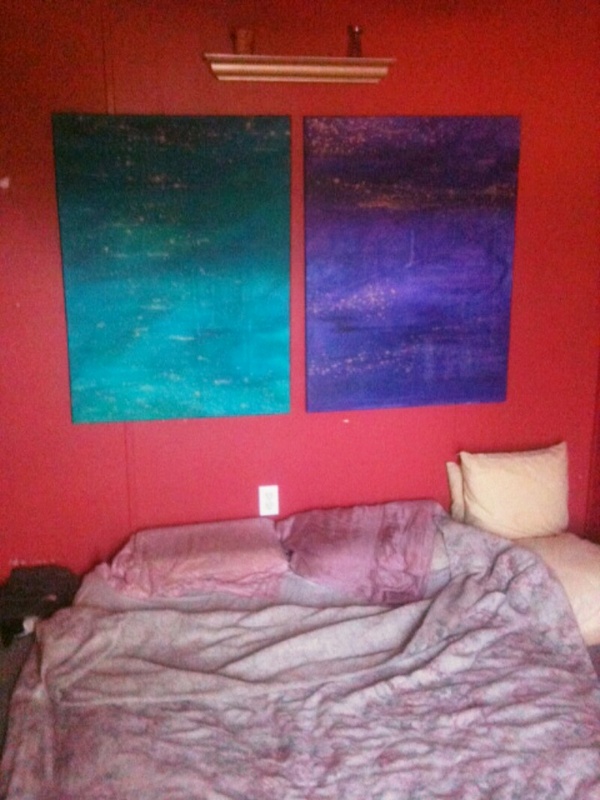 Then, an artist friend of mine gave me these pictures and I knew what my bedroom would look like! Everything came together in my mind, my Master Bedroom Pinterest board got cleaned up and had a few things added as my vision was honed in on. Wanting to eliminate toxins and not add any more, I hunted for affordable paint options. This is when I came across flour paint. It’s affordable, durable, and non-toxic. It met all of my requirements, plus catered to my love of making something simple, myself. Since I wanted light grey walls, I hunted around for coloring options that I could either obtain for free locally or at minimal cost online. I spotted this website on natural paint pigments and got excited. I have charcoal for free in my fire pit and we use calcium carbonate in the toothpaste we make and use. There wasn’t going to be waste on this front! Something I was excited and nervous about was reupholstering a lamp shade I have had for maybe a decade. I am following the guide from Martha Stewart’s video, using fabric from a bag someone gave us. I am making a jewelry tree, since I don’t have very much jewelry and this is cleaner than what I had been using (a lovely little jewelry box my grandparents had given me… and I passed on to Melody). I want to make it like the Shire’s celebration tree, but I am not sure how to do that exactly. Our bureaus are getting a little makeover, too. I am hoping we can get this done before the newest little one arrives this summer, but if not, that’s okay. I’m so delighted in a gift from a friend that was not only so stunningly beautiful for me, but finally inspired me to hone my vision for a peaceful bedroom space for Daryl and I, and propel me to adjust other rooms as well.